Frankie Johnson is an accomplished artist with over 40 years of experience in oil painting and pastels. For the last thirty years, Frankie has taught drawing, oil and pastel painting at The Studio In The Woods (Wauconda, Illinois), The Studio of Long Grove and the Mainstreet Art Centre. She opened the Mainstreet Art Centre in 1994 with a talented staff of instructors. She conducts workshops in portrait and landscape painting at various locations such as The Clearing in Ellison Bay, Wisconsin, Dillmans in Lac Du Flambeau, Wisconsin and the Mainstreet Art Centre. She studied art and design at the Art Institute of Chicago and William Harper College. 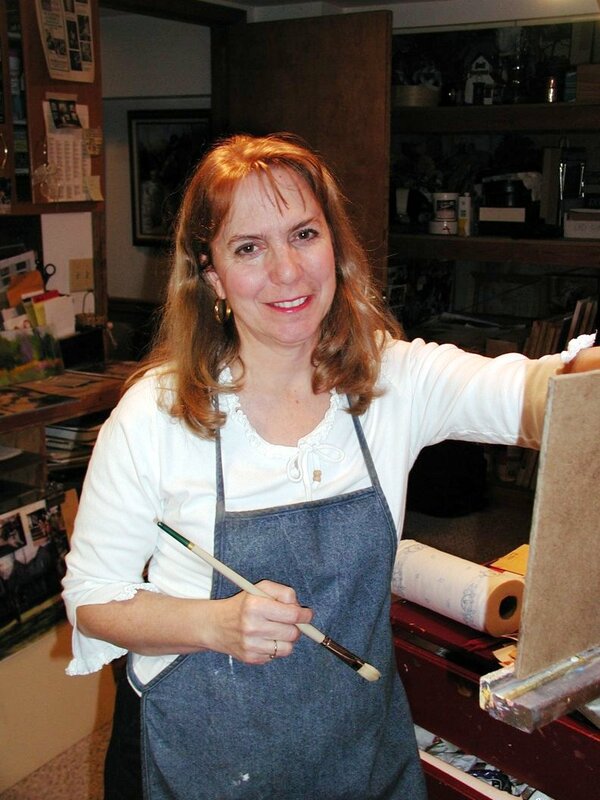 Through her long association with the Palette & Chisel Academy of Fine Art in Chicago, she has studied with distinguished artists such as Richard Schmid, David Leffel, Ted Goerschner, Ted Smuskiewicz, Clyde Aspevig and Scott Burdick. Frankie has participated in many juried exhibitions and plein air painting competitions and won numerous awards for her paintings through the years. Her work has appeared in shows and galleries all over the Midwest. She is currently represented by the Fine Line Designs Gallery in Ephraim, Wisconsin. and Castle Gallery in Fort Wayne, Indiana. Frankie's paintings, including numerous portrait commissions, hang in corporate and private collections throughout the country. Jan is an award winning artist and instructor for over 25 years. She attended the American Academy of Art in Chicago and the Village Art School in Skokie, Illinois and studied with Joe Abbresscia and Irving Shapiro. Previously she taught at the Village Art School in Skokie and the Contemporary Art Center in Arlington Heights, before coming to the Mainstreet Art Center. Her unique and enthusiastic teaching style communicates her passion for the creative process that inspires her students to do more than they ever thought possible. Rachel Joyce has been studying and creating art for most of her life. Her studies began at Mainstreet Art Center at the young age of six and continued at Harper College and DePaul University. Highly inspired by the variety of works by Gerhard Richter, she doesn’t limit herself to one style or medium. She loves learning new ways to create exciting work and enjoys playing in all different mediums including oils, acrylics, pastels and watercolors. Since her graduation Rachel has focused her attention on expanding her portfolio and showing her work around the country. Ardes MacFarlane graduated from the American Academy of Art in Chicago and has attended classes at Harper College, in Palatine, Illinois. She has been an Art Instructor for many years in at the Studio of Long Grove, and at Mainstreet Art Centre in Lake Zurich, Illinois. Jan Oswald majored in art and early childcare education. She taught art and music at the YMCA in Highland Park and has been teaching pre-school for over 25 years. Pursuing her love of oil painting has become a major focus in recent years. She works regularly in her own home studio, where many paintings are waiting their final touch. Jan has been teaching drawing and painting to children at Mainstreet Art Center for several years. Susan Ploughe is a graduate of Carnegie Mellon University in Pennsylvania, with a BFA in Painting. She worked many years as an illustrator and graphic designer. As a full time artist, she is represented by several galleries. She is a member of the Oil Painters of America, Plein Air Painters of Chicago and the Portrait Society of America. Dale Popovich is an award-winning watercolorist and teacher who is passionate about capturing the raw beauty of the American landscape with the fluid stroke of a brush. He trained at The American Academy of Art in Chicago with Irving Shapiro and was deeply inspired by this great American twentieth-century watercolorist. Later Dale taught for many years at the American Academy of Art and the Palette and Chisel Academy of Fine Arts. Karen Sako is a graphic designer with a BFA in Visual Communications from the Illinois Institute of Art. While her 'real job' now keeps her busy in the realm of web design, her true love is oil painting and she spends much of her free time creating mixed media pet portraits. Karen has been sharing her infectious love of art with students in the Chicago area for over half her life. Linda's inspiration as an artist arises from the idea that an artist can see something meaningful, fascinating or moving in life and can recreate the beauty or express those emotions on canvas. She has studied and attended workshops at the Palette & Chicago Academy of Fine Arts with multiple renowned artists and instructors. She is a member of the Plein Air Painters of Chicago, former member of the board of directors at the Palette & Chisel, member of the Highland Park Art League and the American Impressionist Society.